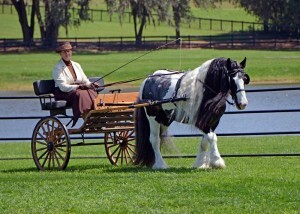 The Vanner Advantage Program is a program that provides awards to those who get their Gypsy Vanner out to events to present the breed to the public.The points are accumulated based on individual horse. To be eligible for the Vanner Advantage awards, the horse must be GVHS Registered and the owner must be a GVHS member. Likewise Youth participants must be GVHS Youth members to participate in this program. This list is not all inclusive but following are examples of some of the types of events that qualify for Vanner Advantage points; open multi-discipline shows (local fairs/ 4H); open discipline specific competitions (dressage, driving, hunter-jumper, eventing, endurance, combined driving etc. ), expositions and breed demonstrations, organized trail rides, clinics open to the public, parades. If you are not sure if your event qualifies check with the GVHS office. Points are awarded based upon event duration and type. Discipline specific awards are based upon performance. The top GVHS horses are presented with Vanner Advantage awards. Likewise the top GVHS Youth members presenting, handling or riding a horse at these events will be awarded. Both the Youth and the horse they are riding or handling can potentially win awards.